Sometimes I really struggle to stay meatless on Mondays if I’m craving a nice creamy pasta dish for dinner. It doesn’t happen often, but when the hunger for rich food strikes, the avocado is my secret, meatless weapon against dairy-meat-munchies! The avocado in this creamy pasta recipe works as a binder, creating a rich, smooth dressing with flecks of bitter greens and zesty citrus notes. You’ll notice that there’s no Parmesan cheese in this dish. Most varieties of that cheese are made with animal rennet– not good for Meatless Monday! I use almonds, nutritional yeast, and plenty of salt in my recipe to replace the “oomph” that Parmesan might add. Bring a pot of salted water to a boil over high heat. Add the pasta and cook until tender but still firm, about 8-10 minutes. Reserve 1 cup of cooking liquid, and drain. Meanwhile, scoop out the flesh of the avocado and place in a food processor. Add the greens, basil, citrus juice, garlic, salt, pepper, almond, and nutritional yeast. Blend until smooth. 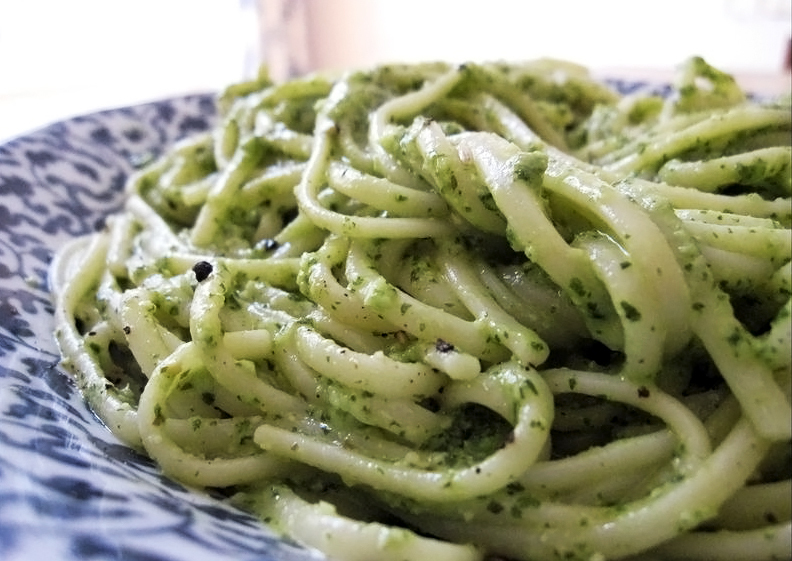 Pour the pesto over the pasta in a serving dish. Toss to coat the pasta with sauce, adding a little pasta water as necessary to loosen the sauce. Taste the finished pasta and season to taste with lemon juice, salt, and pepper. Serve immediately. This pasta is best served on the same day it is prepared, since the avocado will oxidize and turn the sauce an unsightly brown color after a while. Happy New Year! 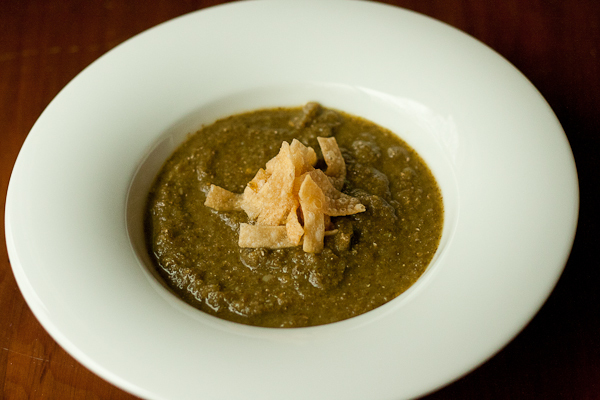 It’s the second Meatless Monday of 2012, and we’re continuing our series of super-easy vegetarian recipes for January. My family loves “breakfast for dinner” once in a while, and this quick and easy breakfast casserole is on heavy rotation at my house. Leafy greens, local eggs, and fresh potatoes make this casserole much healthier than your typical cheese-laden hashbrown supper, and it’s very quick to put together. 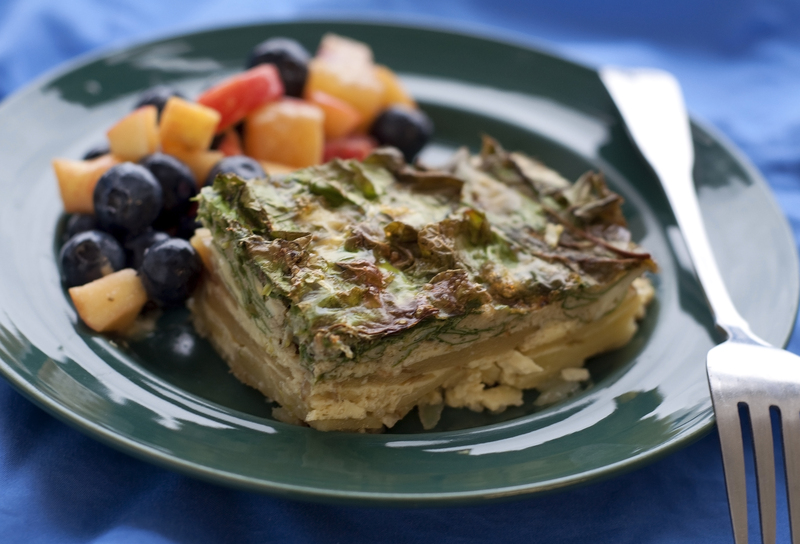 It makes a ton of leftovers, too– perfect for breakfasts later in the week! One thing that really helps with all the chopping in this (and most any) vegetarian supper is a food processor. I used both attachments that came with my machine to prepare this dinner, and the whole thing came together in about 10 minutes of hands-on time. If you don’t have a food processor, plan to add about 10 minutes to the prep time for chopping, whisking, and slicing. Preheat oven to 350 degrees. Lightly oil a 9×13 casserole dish. Wash the potatoes and tender greens and pat dry. Peel the onion and chop it into quarters. Chop the potatoes into quarters. 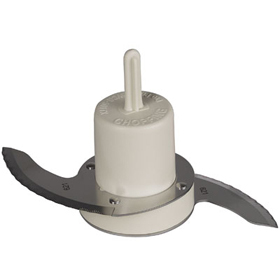 Slice the potatoes and onion very thinly by feeding them through a food processor fitted with the slicing disk. Heat a few tablespoons of oil in a large skillet over medium-high heat. Once oil is hot, add potatoes and onion to the skillet and cook for 6-8 minutes, stirring occasionally. 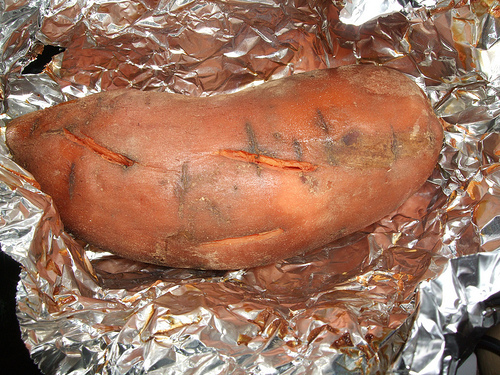 Once potatoes and onions are softened, place them in an even layer in the prepared casserole dish. Top with the chopped greens. Pour the egg mixture over the top of the casserole. Bake for 40 minutes, until the middle of the casserole is set and the edges are golden brown. Serve warm or at room temperature. You may have noticed a flyer for this year’s Vegetarian Chili Cook-off in your Greenling bin this week. 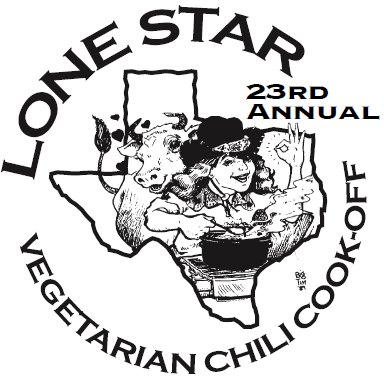 The Vegetarian Chili Cook-off started in 1989 when four vegetarian societies from across the state of Texas joined to form the Lone Star Vegetarian Network. In the years since, the cook-off has been held in multiple locations all across the state, including West Columbia, San Antonio, Houston, Dallas, El Paso, South Padre Island, and Fort Wort. This year nearly 1000 people are expected to visit Old Settler’s Park in Round Rock for the 23rd annual cook-off. The fun begins at 11:30 AM on Sunday, November 13th, and all are welcome. To drum up excitement for Sunday, the Chili Cook-off organizers offered to share a winning recipe for us to publish! 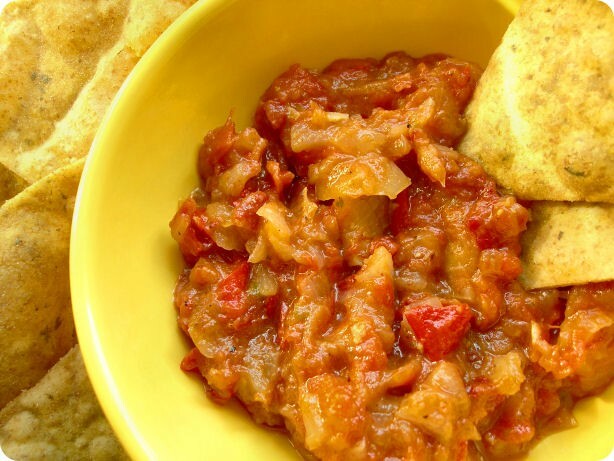 This vegetarian chili recipe comes from Stevie Duda, editor of Austin Vegetarian Living, the newsletter of the Vegetarian Network of Austin. With assistance from other VNA members, Stevie’s chili won First Place at the 2007 Lone Star Vegetarian Chili Cook-off, out of about 20 entries. In a large pot, saute zucchini, onion, bell peppers, and garlic in the oil or broth, until tender. Stir in all remaining ingredients and bring to a boil. Reduce heat, cover, and simmer for 45 minutes, stirring occasionally. Vegetable lasagna is one of my favorite cold weather comfort foods, especially when autumn vegetables like zucchini are abundant. It’s a great meatless main dish, too, because it is filling and pairs perfectly with a quick salad. However, it can be difficult to make lasagna on weeknights since the traditional preparation is so time consuming– up to an hour of hands-on time! This easy vegetable lasagna recipe avoids many of the pitfalls of traditional preparation by utilizing some useful short-cuts to save time. Instead of parboiling the noodles and assembling the casserole in a baking dish, we’ll layer sauce, cheese, veggies and raw lasagna noodles right in a slow cooker. 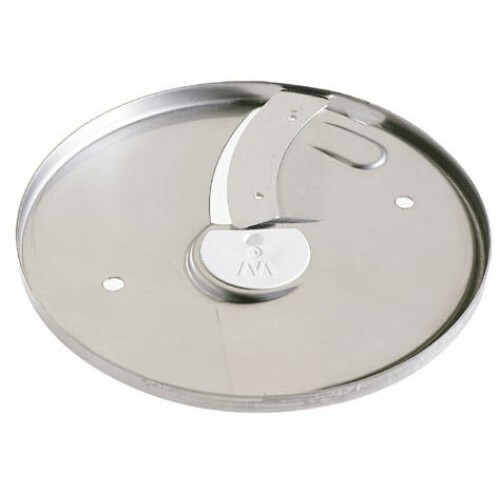 Since the slow cooker retains more moisture than traditional oven cooking, there is enough liquid in the casserole to completely cook the noodles right in the dish. There’s no need to use special no-boil noodles, either. 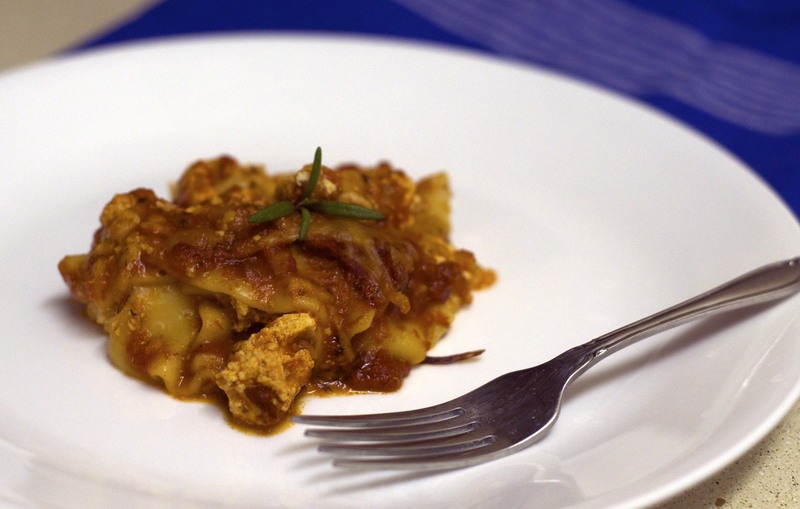 Plain raw lasagna noodles are just fine. Another time saver I like to use for this recipe is my food processor. I use the grater attachment to process my raw veggies for the dish in much less time than it would take to grate or dice them by hand. These veggies blend right into the pasta sauce of the lasagna and give the dish a rich texture and flavor, without adding distinguishable chunks of vegetables. If your family likes chunkier veggie lasagna, by all means cook the recipe as directed with chopped veggies an it will turn out great. Either way, the total prep time for this lasagna should take less than half an hour. 2 cups shredded vegetables: your choice of onions, broccoli, zucchini, mushrooms, peppers, or greens. One large zucchini and half of a large onion yield about 2 cups. In a large bowl, mix together ricotta cheese, Parmesan cheese, egg, oregano, and garlic powder. Shred or chop the vegetables of your choice. Break the lasagna noodles into approximately 1/3-noodle sized pieces with your hands, so that they will fit easily into the crock pot. Use a ladle to scoop about 1 cup of sauce into the slow cooker. Place a single layer of noodles on the sauce. Layer 1 cup of shredded vegetables on top of the noodles, followed by half of the ricotta cheese mixture. Repeat the sauce-noodle-vegetable-cheese layers. Cover this with the remaining noodles. Ladle the remaining sauce over the casserole and sprinkle mozzarella cheese over the top. Cover and cook on low for 4-6 hours, until noodles are tender and most of the liquid in the casserole has been absorbed. Try this one-pot meal for an easy dinner to start the week! The light, creamy sauce and touch of lemon really let the flavors of the veggies shine here. If you don’t have gemelli, any short pasta will work! In a large pot of boiling salted water, cook pasta 2 minutes less than al dente. Add squash and peas; cook until squash is crisp-tender, about 2 minutes. Reserve 1/2 cup pasta water; drain pasta mixture, and return to pot. To mixture in pot, add butter, lemon juice, 1/4 cup Parmesan, and 1/4 cup pasta water. Season with salt and pepper, and toss to combine. If needed, add enough pasta water to create a thin sauce that coats pasta. Stir in basil, and sprinkle with remaining 1/4 cup Parmesan; serve immediately.